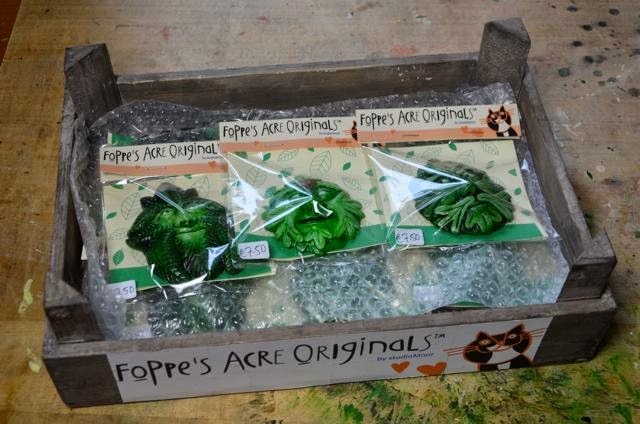 foppe's acre originals: Ready set Go! All packed and ready to go to the fair tomorrow! Phew. Spent the day making inventory, pricing, wrapping, packing, do some last minute shopping and make sure I've got everything ready. Looking forward to a busy day, hope it will stay dry as it's an outdoor event (but I'm prepared). This blog is all about the story of Foppe's Acre Originals, the brand Peter Moorman created for his private artwork. Works as a freelance illustrator and runs his business studioMoor from home at Foppe's Acre. Foppe's Acre is a little farm in Friesland, the Netherlands, owned by lord and master Foppe the cat. On Foppe's land live all kinds of animals, peacefully side by side. The residents at Foppe's Acre are a constant inspiration for Peter's private work. First Green Man magnet finished! Green Man in the making! © studioMoor 2018 | Peter Moorman. Thema Eenvoudig. Mogelijk gemaakt door Blogger.